It's been a while since I've dealt with Iwill products but I've always had a lot of fun with them. Iwill isn't really targeting the overclockers with the P4GS, but more likely the average user who wants a solid motherboard, with a lot of features. A quick glance at the hardware features shows us that the P4GS is a pretty well rounded motherboard, it has onboard 10/100 LAN, 5.1 audio, IDE Raid, Serial ATA, support for memory stick and secure digital cards. There are five PCI slots should you find the need to upgrade a part of your computer, a 4x AGP (1.5V lock) slot and USB 2.0 comes native thanks to the ICH4 southbridge. As you probably noticed, there are only two DIMM slots which can support 2 GB PC1600/2100 memory (PC2700 unofficial support). The Iwill P4GS is a pretty compact motherboard that uses a rather odd layout.The first thing that stands out is the odd placement of the IDE RAID controller connectors but we'll get to that a little later. 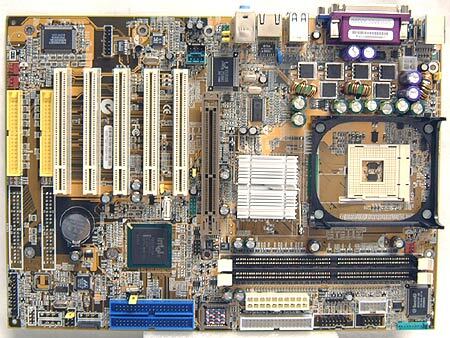 One place Iwill always excel's at is how well they label the motherboard. It can get quite frustrating when you have to keep referring to the manual to find out what certain jumpers do; Iwill takes the guess work out by putting diagrams/labels right on the PCB! This certainly makes life so much easier! The main ATX power connector is in an excellent location to the right of the DIMM slot and even though the P4 power connector is to the left of the CPU socket, it's near the top of the motherboard. Iwill uses a sliding AGP lock rather then the usual switch which is easier to use then the regular switch. 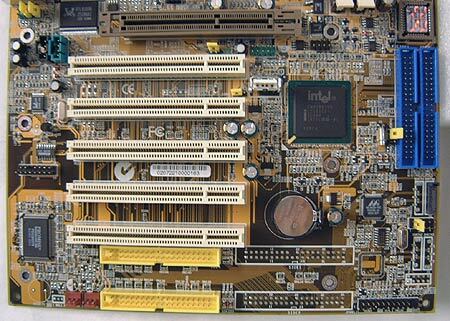 With more and more high speed USB 2.0 devices coming out, Iwill has put an internal USB 2.0 slot on the motherboard. At first glance, we thought that perhaps it should be closer to the edge of the motherboard to keep out of the way of other things, but then we realized that Iwill put the USB next to the PCI's to prevent it from breaking off. I love those longer jumpers that Iwill uses for their boards. They're so much easier to use then the regular short jumpers! The P4GS is far from perfect as a motherboard though. The weirdest thing about the board is the location of the IDE RAID connectors. We're not really sure why they're below the PCI slots, this makes things extremely difficult for users of full tower cases and even people with mid towers would need to wrap the IDE cables around the PCI/AGP peripherals to get to the IDE drives!